When we think of building web applications or services in .NET, we usually confine ourselves to core ASP.NET technologies. There is no doubt that Microsoft has put in a lot of efforts in building some awesome web frameworks and tools to make our lives easier, but there are alternatives to Microsoft's set of technologies that are worth taking a look at. ServiceStack is one such option. ServiceStack is a thoughtfully architected, obscenely fast, thoroughly enjoyable web services for all. ServiceStack is a configuration free, code-first, light-weight framework built on top of ASP.NET for building services and web applications. As the name suggests, it is a stack of services. It provides with just everything that one needs for building end-to-end web services. In a way, we can say that it is a light-weight alternative to WCF, Web API, ASP.NET MVC, ASP.NET Web Forms and any framework using which we can develop web apps or APIs. What is the ‘Stack’ in ServiceStack? To learn more about the features, you can visit https://servicestack.net/features. The good thing is, ServiceStack doesn’t depend on any third party to support any of its feature. It is a self-contained and self-independent framework. Using ServiceStack, one can quickly build APIs that can be hosted anywhere (IIS, Windows Service, Self-host or Mono) and consumed from anywhere. Building a ServiceStack API is really easy as it doesn’t need a lot of configurations before getting the service up and running. ServiceStack defines a set of conventions that make the job of writing and exposing services easy. The pieces in the ServiceStack are totally independent of each other and can be used in isolation. For example, if you only want the JSON parser of ServiceStack for your application, you can include it alone and use it. In addition to all the rich features, ServiceStack embraces the practices of clean code, which means, the logic that we write to expose services using ServiceStack are fully testable. As listed in the features, ServiceStack supports Razor views. This feature enables to create Razor pages to render the data exposed by the Services. To bootstrap ServiceStack, we need to register the ServiceStack components when the application starts. To do this, add a new class to the project and name it AppHost. This class should inherit from ServiceStack.AppHostBase class. The class AppHostBase doesn’t have a non-parameterized constructor. The constructor expects a name for the service and a list of assemblies where the services are defined. As we haven’t created services yet, add a class named StudentService to the project. This class can be left empty for now. We will come back to this class later to add code to it. Note: If you want to avoid the above steps while creating a ServiceStack project, install the ServiceStackVS extension through extensions gallery. It installs some project templates that include all the required hooks to build a ServiceStack application. 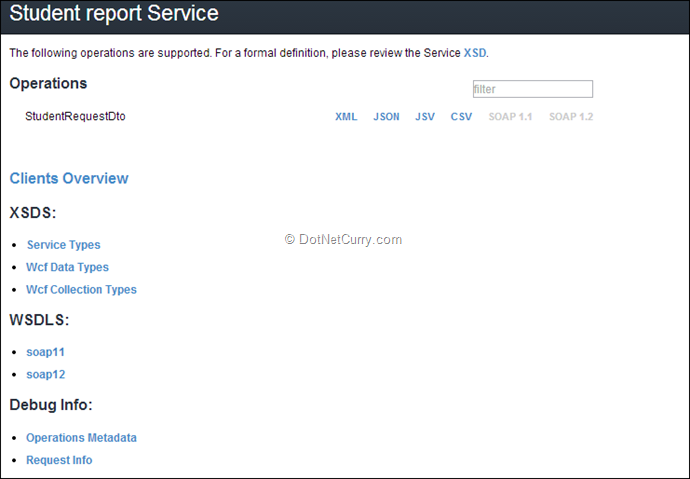 ServiceStack is based on DTOs (Data Transfer Object model). To define a service, we need at least one request DTO class. For instance, say we need the ID of a student in the service, then the request DTO can be a class with the field ID. If you need data, additional properties can be added to the DTO class. We need to expose any service through an endpoint. Endpoints can be created using Route attribute defined on ServiceStack namespace. Unlike ASP.NET Web API, where we define routes in the service controller, ServiceStack routes are defined on DTOs. As you see, the above DTO exposes two endpoints: one plain endpoint with no parameters and the second one with Id as the parameter. Similarly, change value of format to any of the supported types and you will see the corresponding result. In the service class, we need to define the corresponding methods following their conventions. Notice the first route in the above snippet. This route is to enable fetching marks of a particular student. The route is defined this way to avoid confusion between accepting MarksId and StudentId into the API. We will define a service for this DTO later. ServiceStack includes a light-weight micro ORM called OrmLite. It is one of the fastest .NET ORMs. It is not as configurable as Entity Framework, but still provides a good set of features to interact with databases. OrmLite has DB specific implementations for all major databases including SQL Server, Oracle and MySql and some others like PostgreSQL, FirebirdSql and Sqlite. We will be using the SQL Server version. Let’s make this object available to the entire application through the built-in IoC container of ServiceStack Funq. Funq in ServiceStack is based on an open-source IoC container named Funq (http://funq.codeplex.com/) with the framework adding more capabilities to its implementation. ServiceStack internally uses Funq to register objects of the Service classes, Filters and Validators. Objects registered to Funq are injected through both constructor and property injection. To read more about Funq, visit ServiceStack’s wiki on GitHub (http://bit.ly/dncm15-sswiki). The AutoIncrement attribute in above snippets denotes a table column with auto incrementing values, which is Identity column in case of SQL Server. References attribute in the Marks class defines a foreign key reference. To fill these tables with data, let’s create a new class DbInitializer. This class will have just one static method InitializeDb. This method checks for existence of tables, creates the tables and fills in data if the tables don’t exist yet. The last operation that we need to perform is updating marks. It is a straight forward operation and returns the number of rows affected. With this, the repository is completed and now we can use it in our services. As the service classes need an instance of the repository class, let’s make the instance available through the dependency injector Funq. The ReuseWithin() method chained with the Register() method is used to define scope of an instance registered. The repository object is scoped within the HTTP request. The object is destroyed as soon as the request ends. Following are the modified StudentService and MarksService classes. In the services we wrote till now, we are returning plain objects. ServiceStack internally wraps this data inside an HTTP response before sending it to the user. But you may want to get control over the HTTP response and send data along with a status code of your choice to the client. This can be done using IHttpResult. Both HttpResult and HttpResult have a number of overloaded constructors offering flexibility to set status code, response type, message and a number of other HTTP parameters of our choice. Till now, we used the Service and Data access features of ServiceStack. Let’s complete the demo application by adding some views. ServiceStack supports Razor and markdown razor views. If you are already familiar with the Razor views in ASP.NET MVC, you don’t need to learn anything new to use the view engine of ServiceStack. The difference between ServiceStack and MVC appears when we see the way views are rendered in these frameworks. Unlike ASP.NET MVC, ServiceStack doesn’t need a controller. Data for the view is passed from the corresponding Service method. This data is available to the view in the Model object and the view can use it for model binding. Views are rendered on the same endpoint where the service is exposed. But we can still get the data served from these endpoints by specifying format of the data in the URL. We have already added assembly required for Razor views while installing the NuGet packages. We can start building the views now. As a first step, let’s configure Razor as a plugin on start of the application. By default, an application doesn’t know about the razor views. We must add some configurations in Web.config to be able to use the view engine seamlessly. Luckily, the NuGet package ServiceStack adds all the required configurations to Web.config. You can check your Web.config file to see the new configurations. Like in case of MVC, the views in ServiceStack get the dynamic object ViewBag. Here we are using it to set title of the page dynamically. 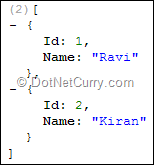 By convention, names of the Views should be same as the name of the corresponding request DTO classes. As we have two DTO classes, add two files named StudentRequestDto.cshtml and MarksRequestDto.cshtml to the Views folder. Both these files automatically extend the layout file, we don’t need to declare it anywhere. No marks added for the student yet. Note: The markup has been truncated here to save some space. 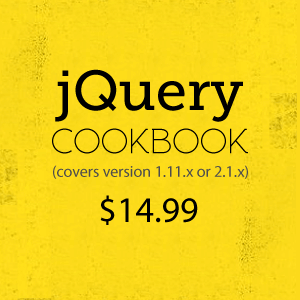 Please download the source code to view the complete markup. In the layout page, we have defined an optional script section that can be used in the child pages to include custom scripts. Before executing the custom script, we would have all the libraries loaded. Alternatively, we can bind data to the table manually to avoid refreshing the page. I used this approach to keep things simple. Similarly, we need to write script to send a PUT request when marks are modified. I am leaving this part as an assignment. The solution is available in the downloadable code for this article. I hope this article helped you to get started with ServiceStack and also got your hands dirty with it. Using ServiceStack, it is easier to build services and views and get them running on any platform of your choice. The good thing is, it doesn’t depend on any other third parties to make any of its component work. At the same time, the components in the framework are built with a vision of easier usability, speed and modularity in mind. ServiceStack is not limited to the set of features discussed in this article. We will have some more articles in future focusing on more capabilities of this great framework. I encourage you to check out the GitHub projects (github.com/ServiceStack/ ) and their official wiki (https://github.com/ServiceStack/ServiceStack/wiki) to learn more about the framework. It says there's no class named StudentResponseDto and you give no information on what you have to do to implement that class. Thanks and good to know that you are using ServiceStack. Repository class in the sample is more like a data access layer. It is a single place where all DB operations happen. If the application grows, we need to refactor it to a set of repository classes. I agree with your point of creating an interface for the repository, as it would make the service classes testable. Thanks for bringing this point. This step is not for the sample app. My intention was to just give an idea that you can specify return type of the service in the request DTO. If you want to specify the return type, add it to the request DTO class created in previous step and define the response DTO class with properties that you want to return from the service. I'm running ServiceStack 4.0.35 in vs2013. I did installed all the components mentioned in your article step by step. However, when I tired running the application for the first time in IIS 8 express. After doing this change i was able to view the metadata screen mentioned in your article. Not sure whether it was my mistake or nuget was not able to configure the web.config properly. I think, NuGet didn't update the configurations in web.config file. I will give it a try and see if I face the same issue.